The supernatural forces of summer create heat in the Heavens and fire upon Earth; they create the heart and the pulse within the body… the red color, the tongue, and the ability to express laughter... they create the bitter flavor (dark chocolate!) and the emotions of happiness and joy. 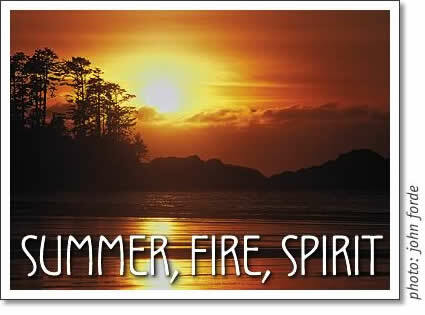 Summer and fire are associated with the heart, home of spirit. Ruled by the heart meridian, spirit is like an emperor/ empress. It is the seat of wisdom, truth and beauty that resides within us. When the heart is balanced all other organs and processes function as they should. The Chinese word for heart is xin, which is translated as heart-mind. In addition to governing our physical bodies, the heart also affects our consciousness. Spirit is our connection to the Tao, or Oneness, and is equated metaphorically with light. It is the divine spark within us, insight, awareness on all levels: mental, emotional, and physical. When our decisions, speech and actions are made in accordance with our spirit we are healthy and at ease with ourselves. Life is effortless, an adventure unfolding, a place of infinite possibilities. Our imagination is our only limitation. It sometimes happens that we doubt our intuition and disassociate from our heart. We react instead according to learned ideas and emotions triggered by fear and experiences we may not even consciously remember. This disrupts the energetic flow within and interferes with the clarity of our spirit’s message. Sometimes energy blocked in another element will cause an imbalance of fire energy, which upsets the balance of the heart. Tamara Watson is a registered Jin Shin Do & Shiatsu Therapist, certified in traditional Thai & Hot Stone Massage. She has a private practice in Tofino and will be teaching a Jin Shin Do” Neck & Shoulder Release Workshop in June (see Community Calendar. Phone her at 250.25-3976; sensingbeauty@yahoo.ca. Tofino health: Tamara Watson explains the concepts of xin and summer, fire, spirit in traditional chinese medicine.